Not exactly the most exciting of products, but an important one. 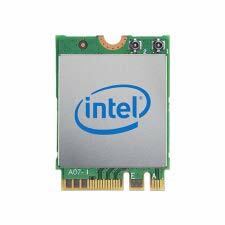 Intel has launched their Wi-Fi 6 capable AX200 module using the M.2 2230 form factor. It is an important release because as it currently stands, several manufacturers have announced Wi-Fi 6 capable routers, with some already on the market, but there has been no network adapter on the market to make the most of it. As far as I am aware, the Samsung Galaxy S10 is the only consumer device on the market that can make the most of the Wi-Fi 6 standard. Previously codenamed Cyclone Peak, this card is very similar to the existing model of the Wireless-AC 9260, but with the advantage of adding support for WiFi 6, also known as 802.11ax, hence the AX of the name of the card. At the speed level, the card offers speeds of up to 574 Mbps in the 2.4 GHz network, while it will offer up to 2,402 Mbps in the 5 GHz network. The card has two antennas for 2 × 2 MIMO and it supports 5GHz using 160Mhz. As with olders cards this has Bluetooth and it using the latest Bluetooth 5. The M2 form factor used is only compatible with laptops as the one in a PC is Key M and they just don't fit together (I tried when I upgraded my laptop card, because I am an idiot). The card has technically been launched already, but it will take a few days to appear for sale. The price of each card varies between $10 and $17 for manufacturers who will include it in their laptops and compact computers. Sooner or later the card should become available for consumers to upgrade their laptops. The current Intel Wireless AC 9260 is just £20 on Amazon so they tend to be quite affordable. NextFisher Wallace Stimulator: Improving the quality of your life!